New graduate student in art history Reed O’Mara has hit the ground running. This May, she presented her research titled “The Geometry of the Co-eternal Word in the Uta Codex,” at a special session for undergraduates at the 53rd International Congress on Medieval Studies in Kalamazoo, Michigan, the world’s largest annual gatherings of medieval scholars. 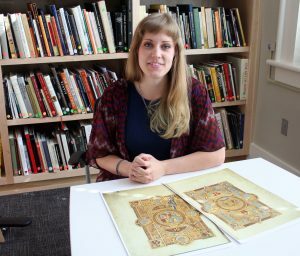 Last year, while she was still a senior at UA (a double major in German and economics with a minor in art history), she developed a unique research project on the famous medieval illuminated manuscript, the Uta Codex. The Uta Codex was a gospel book or lectionary commissioned around 1025 by Abbess Uta, head of the Niedermünster Abbey in Regensburg, Bavaria, Germany, and is considered one of the most significant manuscripts of its time. 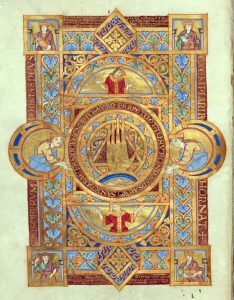 One of its elaborately decorated frontispieces is referred to as the “Hand of God” page. O’Mara used the texts contained in the codex, the Gospel of John, the Creation story in Genesis, and the works of St. Augustine, to interpret the complex and innovative design of this page. Although the image has been studied and written about by many learned scholars, O’Mara’s idea about it is a completely original approach. She will present her research, titled “The Geometry of the Co-eternal Word in the Uta Codex,” for the first time at the 53rd International Congress on Medieval Studies in Kalamazoo, Michigan, in May. O’Mara was awarded a competitive Barbato Fellowship in art history to Case Western Reserve University in Cleveland, Ohio, where she will attend in the fall of 2018 as a graduate assistant with a full tuition scholarship and a stipend. In the same conference session for research by undergraduates at the 53rd International Congress at Kalamazoo, senior double major in art history and anthropology Sommer Hallquist presented her research paper, “Representing ‘Wicked’ Kingship: Images of Antichrist within Bible Moralisée Codex Vindobonensis 2554, Vienna, Österreichische Nationalbibliothek.” Hallquist is one of two recipients of the 2018 Alumni Student Award, which is given each year by the National Alumni Association. 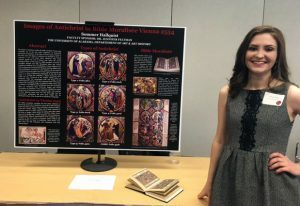 In addition, for her research, she won first prize at the UA System Honors Research Conference and 4th place in the URCA Poster Session in the Arts and Humanities Division. Hallquist also won the C. Earle Smith Memorial Award in the Department of Anthropology. She will attend Cambridge University in the United Kingdom in the fall semester.